TvN’s new television series “Marriage over Love” aims at catching both reality and heart-throbbing romance, director Song Hyun-wook said in a press conference held in southeastern Seoul, Thursday. “You will find the drama is fun, heart-throbbing and sometimes touchy and a perfect match for the upcoming hot summer,” director Song Hyun-wook said. “The ‘fun’ comes when the drama has the audience sympathize with the characters… We tried to keep the drama totally distant from reality,” he added. “Marriage over Love” is a rom-com series about a young man and young woman who have totally different upbringings, economic statuses and above all, views on love. 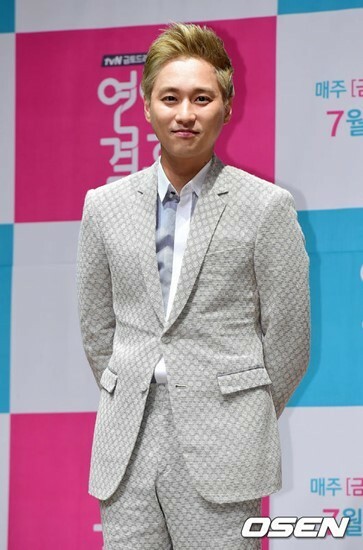 Gong Gil-tae, played by Yeon Woo-jin, is a 33-year-old single who does not believe in marriage. Born to a wealthy scholar family, he is a popular surgeon and womanizer. He picks Joo Jang-mi as a contract wife who will satisfy his marriage-obsessed parents and his anti-marriage lifestyle. Jinwoon of boy band 2AM, Sunhwa of girl group Secret, actress Yoon So-hee and actor Huh Jeong-min will also make appearances and show the different types of dating philosophies. Jinwoon plays a part-time worker whose painful memory keeps him from falling in love. Sunhwa plays a wealthy, single plastic surgeon who thinks women can do without men. Yoon plays Jang-mi’s colleague who wants to hit the jackpot by marrying a wealthy man, whereas Huh plays a wealthy man who wants Jang-mi only as a date and not a wife. The Friday-Saturday drama kicks off on July 4 at 8:40 p.m.